A key to a successful nonprofit is the strength of its volunteers. These selfless individuals offer their time, talent and passion to every aspect of an organization’s operations – from working with clients, to organizing fundraising events, to providing guidance and vision as a board member. Each year, nonprofit organizations are invited to use this day to honor a special volunteer and recognize their distinguished service. We call these dedicated individuals our Volunteers in Philanthropy or VIPs. Honor one of your distinguished volunteers at our 2018 National Philanthropy Day® Awards Luncheon. When your organization purchases a table of ten at the awards luncheon, you have the incredible opportunity of recognizing your very own Volunteer in Philanthropy (VIP)! Cost for VIP table is $1,500. Your VIP will be personally recognized during the luncheon, up on the large screen and in the printed program insert. 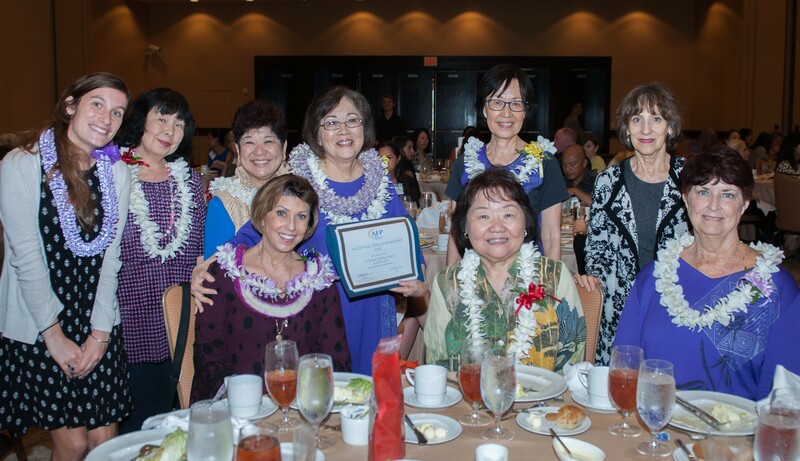 Each VIP will be presented with a beautiful certificate and lei while our emcee describes each one’s selfless dedication and service to your company, organization, or nonprofit. It is the perfect way to say thank you to your VIP while cultivating other volunteers, board members, and donors. Scanned photos should be at least 4" across at 300 dpi. Digital photos should be set at the highest resolution. The deadline for submission of Volunteer in Philanthropy honorees is Wednesday, October 10, 2018. Extended to Friday, October 19, 2018! Purchase your VIP table today!